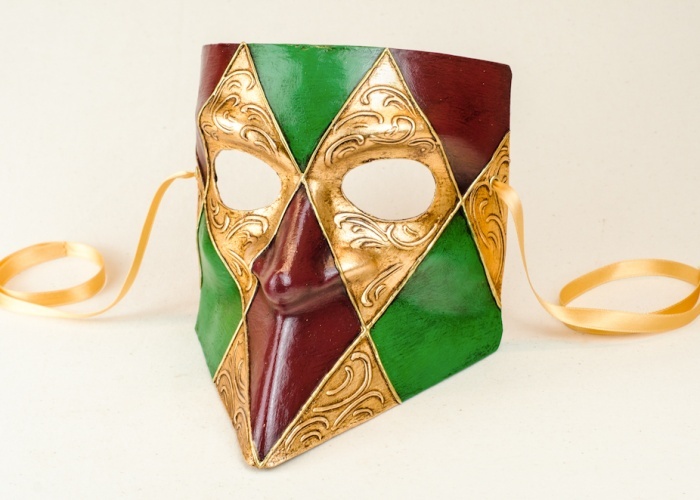 The bauta mask for sale here is decorated with a classic diamond pattern with green and burgundy colors alternating with an impressive gold leaf. Stucco arabesques and a glossy finish complete the decoration of the 'Michele 4'. This is one of our best-selling carnival masks for men. We ship our products with DHL service. Delivery usually takes 5 to 8 working days, depending on the availability of the purchased masks. For urgent orders, please contact us at info@camacana.com. For more information about shipping and delivery times, please click here. Opt-out and more informations about cookies here. The oldest and finest mask making workshops in Venice. has been added to cart. ").appendTo("#SliderImgProdotto .owl-carousel"); $(" ").appendTo("#SliderImgProdotto .owl-carousel"); }); var P_LinkImgZoom=$("#wdgProdImmagine a").attr("href"); P_LinkImgZoom=P_LinkImgZoom.replace("-Zoom", ""); P_LinkImgZoom=P_LinkImgZoom.replace("Thumbnails/", ""); var P_LinkImgResp=$("#wdgProdImmagine img").attr("src"); $(" ").appendTo(".easyzoom"); $(" ").prependTo("#GalleryInnerZoom"); //$("